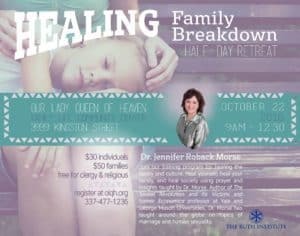 All are invited to join Dr. Jennifer Roback Morse for: HEALING FAMILY BREAKDOWN – a 1/2 day Retreat. Has your family suffered from kids not living with both parents? Grandparents stepping into the breach? Have you had to deal with separations, divorces or never-been-quite-put-togetherness?